I was with my friend Craig when I first heard about 3D printing. He was a graduate student studying architecture at Pratt Institute. We walked around his studio space, and he showed me what he had been working on for his upcoming critique. Then he took me into the 3D printing room. There were other students there, waiting for their sculptures and skyscrapers to dry. I was impressed, but if I’m honest I didn’t think too much of it. 3D printers seemed to me like impressive toys more than useful tools. Sure, you could make a small-scale building, but how was that that different from a toy building? A few weeks later, I was at an open-air market/art space and there was a company with a 3D printer on display. I watched the demonstration: the operator made a little David Bowie statue, a hammer, and a necklace. Again, it didn’t strike me as much more than a very expensive toy. Then I came across a video. I have a feeling I’ve said this before, but I’m not the video sharing type. I don’t like being sent them, and when I do see something impressive or funny, I tend to forget to send them on. I know, it’s not very nice. I’m working on it. This video, however, is different. It starts with Richard Van As, a master carpenter in Johannesburg, South Africa. Van As lost his fingers in a work-related accident. While at the hospital, he decided to build a new set of fingers for himself. It took him some time to find someone who was willing to help, and eventually Van As came into contact with Ivan Owen, a mechanical props specialist in Washington State. Together, Van As and Owen started working on plans and prototypes for functional prosthetic fingers. As you can imagine, with Van As in South Africa and Owen in the northwest United States, the process was long – until MakerBot, a company that manufactures 3D printers, donated a MakerBot Replicator 2 to their cause. What once took months – the building and testing of different prototypes – was suddenly being accomplished in hours. They could come up with an idea or improve a design, and in minutes each have the new part in their hands even though they were thousands of miles away. The two posted the progress of their collaboration, now called Robohand, to Facebook, and it was through Facebook that Yolandi Dipenaar reached out to Van As. She wanted to find out if Van As and Owen could help her son, Liam, who was born with amniotic band syndrome, without fingers on his right hand. 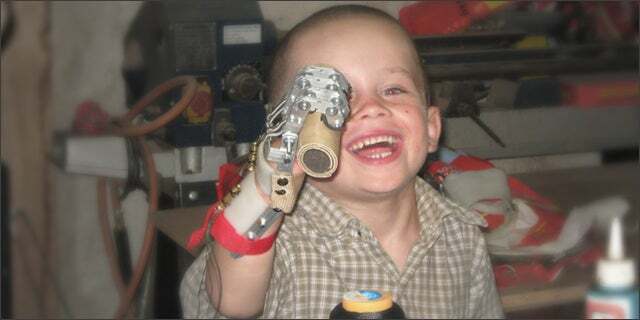 Days later, Liam was fitted for his first Robohand. Word spread quickly, and soon Van As and Owen were making Robohands for other children like Liam. Many of these children are young, and would outgrow traditional prosthetics, which cost thousands of dollars, within a year. A Robohand costs about $150. Van As and Owen never thought that they would be helping children all over the world, but after the success of Liam’s Robohand, they posted the specs and assembly instructions on Thingiverse. Anyone with access to a 3D printer can make a Robohand. The files have already been downloaded nearly 4,000 times. There’s clearly more to 3D printing than David Bowie dolls and toy skyscrapers. Who knows what’s possible, how many things can be made, people helped, and lives bettered because of a desktop 3D printer. All it takes is imagination. Daniel Cassady is an experienced freelancer, guest blogger, and frequent contributor to a blog hosted by Benchmark Email Marketing services.